Is there any doubt about the trend for BCE? Yes, it is definitely up. Defining the tend is the most important concept in technical analysis. You must always trade in the direction of the trend and jump aboard for the ride. Use candlesticks and other confirming indicators — moving averages, on balance volume and momentum indicators — to determine when it is time to exit the trade. All the indicators will be reviewed in future posts using real time examples. And, the objective of the site is to keep-it-simple: anyone can complicate a topic. See the article in the National Post on the analyst upgrade for BCE. The chart snippets are from BigCharts.com which I recommend and have used for fifteen years. 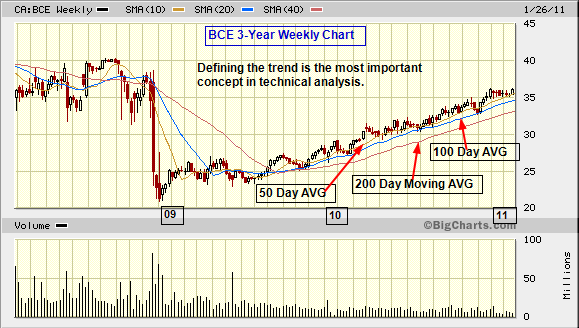 This entry was posted in Stocks and tagged BCE, trend on January 27, 2011 by Trader.